Have you been trying to transfer playlist from iPod to iTunes but often met a brick wall? You are not alone. It often happens that you are able to transfer your songs, but when it comes to playlists, it is a different story. However, that challenge can be easily solved with a solution we will explain in this piece. You might have heard of many methods of transferring playlist from iPod without using iTunes, but you likely have seen how difficult it could be without using a genuine software to achieve the aim. It gets more frustrating using software that could not get the job done. iMyFone TunesMate is the right third party application to get the job done without having to transfer playlist using iTunes. TunesMate easily helps to transfer all your playlists on iPod without the need to use iTunes which may require your ID and others. Using TunesMate does not require a password. It is easy to install and run on your iDevices and can work between those iDevices, making your tasks completely stress-free. You may want to learn more about this awesome software. Below are some standout features. Transferring between devices you have is one of the remarkable features of TunesMate. 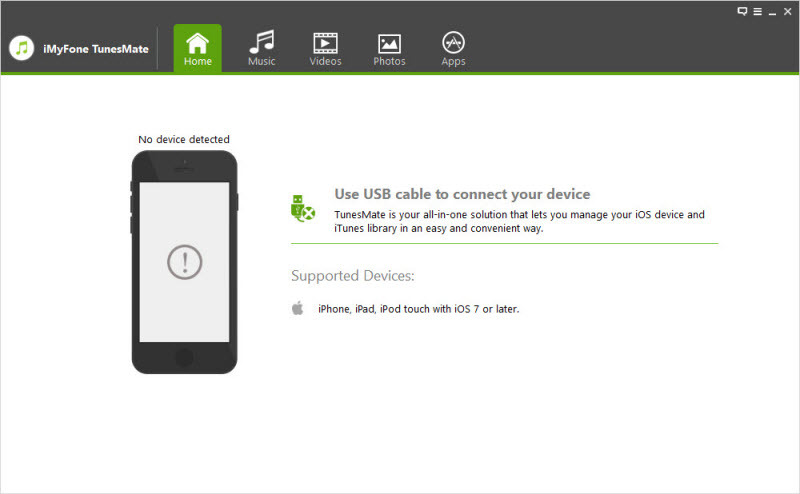 You can transfer from your iPod/iPad/iPhone to Mac and vice versa. 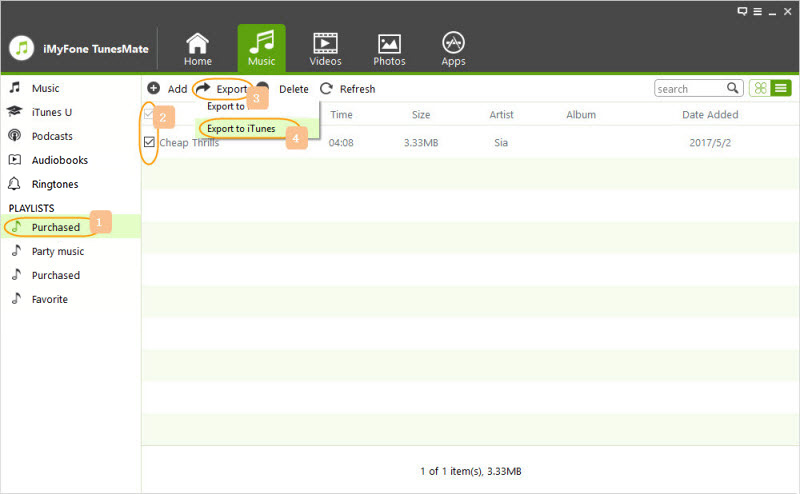 Similar to the above, you can import and export bulk data or playlists between your device. All you need, in most cases, are just few clicks. There is also no limit of transfer you can make for both your device and PC. TunesMate, unlike others, gives you the opportunity to preview all your playlists and select which you need to be transferred. You can view and manage all the playlists on your screen. Exactly what every Apple’s device users need. You can use TunesMate to easily bypass iTunes and transfer whatever you want. No ID or password needed. Let’s see how to use TunesMate to transfer playlist from iPod to iTunes. Download and install TunesMate on your computer and connect your device. Click on Music from the setting menu, then preview your playlists and right click on the playlists to export to iTunes. You can also freely select some songs in the playlist to transfer. Your favourite playlists will be transferred successfully in a few minutes. 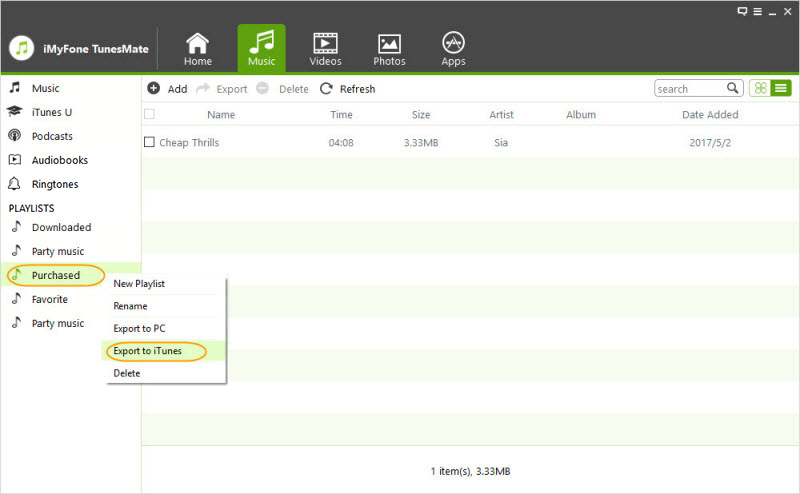 As you can see, it is simple to use TunesMate for transferring playlists on your device. However, you may still want to transfer using iTunes. If so, we have you covered in this piece as well. Transferring playlist with iTunes is not difficult, but you may not enjoy the flexibility and free pass you have with iMyFone TunesMate. Nevertheless, let us look at the steps to take if you wish to transfer playlist with iTunes. Open iTunes, connect your iPod to PC. Click on File, then Library. Export the selected playlist and choose XML from the menu. 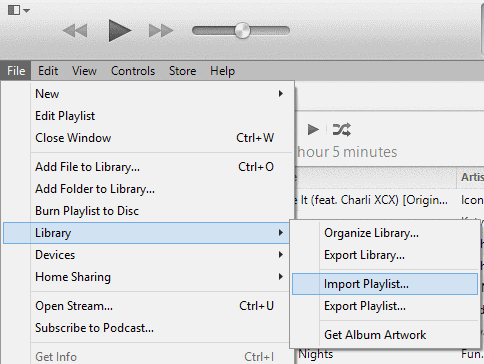 You can also import directly from iTunes using the same steps above. Transferring playlists from iPod to iTunes without using iTunes or password may sound unbelievable, especially if you have always transferred using iTunes. However, you can easily bypass through TunesMate in this piece.